A while back I made some Cinnamon Rolls and it was a big hit so it was requested again and again but now I will be trying a different version using apples and caramel as its main ingredients, I got this idea when one of my colleagues brought some baked goods at the office and some of it were stuffed with apples and topped with a creamy sweet glaze. I immediately thought that this would be a great idea for a cinnamon roll but instead of the normal white glaze frosting, caramel would be a good substitute. This recipe was adapted from my original Cinnamon Roll post as they share the same dough only the filling is different, the result was phenomenal and I guess it was better than my original Cinnamon Roll, I can say that as my daughter ate 5 in one day, 2 before lunch and 3 before dinner. Dissolve the yeast in warm water. Set aside. Mix together flour, sugar, and margarine, salt, eggs, milk and yeast mixture. Once evenly mixed knead the dough in a floured board. Form into a large ball then place in a bowl covered in cling wrap. Place in a warm place and let it rise for 1 hour or until it doubled in size. Remove dough from the bowl, deflate and roll into a floured surface until it reaches 24 x 16 inches in dimension. The thickness should be around 1/4 inch. Prepare the filling by mixing brown sugar and cinnamon together. Spread the softened margarine over the top of the flattened dough, sprinkle the cinnamon mixture, apples and raisins. Now start rolling starting on the 24 inch side until the end then cut into 2 inch slices. Place in a greased pan and set it aside for 30 more minutes letting it slightly rise again. Bake for 10 minutes in a 200C pre-heated oven. Prepare the icing by mixing all of the ingredients in a double boiler in very low heat and using a hand mixer mix in high speed until smooth and fluffy. But if your butter, cream cheese and sugar is soft enough you can just mix it without the use of double boiler. When rolls are cooked, top it with icing and let it cool. I love your apple filling variation. A caramel apple colliding with a soft cinnamon roll — YUM! Great adaption of your original recipe. Yum!!!!!!! Have a nice weekend Reymund! Wow, love the addition of the apple, looks great! 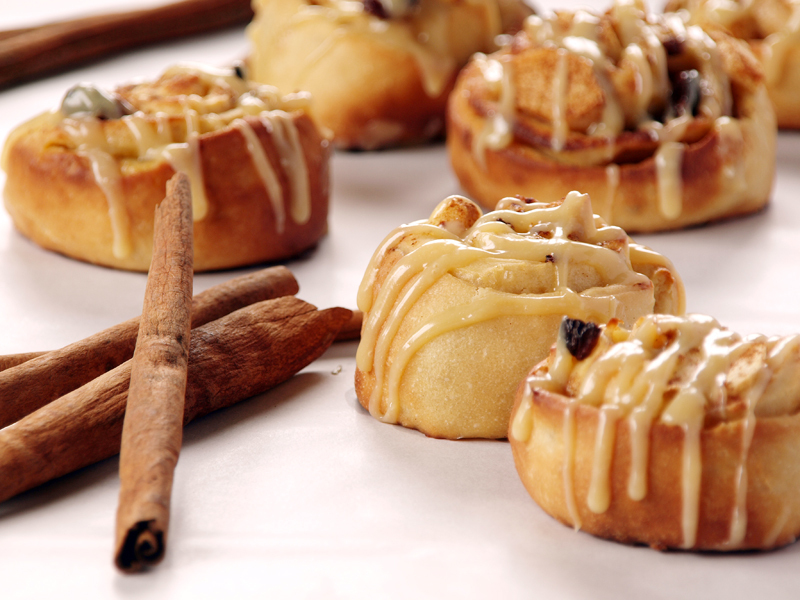 I am such a HUGE cinnamon roll fan.. and I love a new recipe I can try. Love this Raymund.. These look gorgeous! I’m not fond of raisins a lot of the time, so I think I’d use cut up dried apples to just boost the apple flavor further, but it’d be delicious even *with* raisins! Is the icing cooked on the double boiler? This is perfect with a hot cup of coffee! Rolls look beautiful, Raymund! Love these rolls. The apple and the cinnamon must go so well together! I like the addition of apples to the filling. I can only imagine how great these smell! Oh wow! I love sweet pastries of all sorts but cinnamon and apple stuffing sounds especially delicious! And your photo looks great! Any recipe in which your daughter ate 5 is a sure fire one to try! I really love the twist you put on the traditional cinnamon roll. Glazed in caramel would be perfection. The photo is gorgeous! I remember your cinnamon roll! Now new version… looks so delicious! I can compete with your daughter! Maybe 3 and 3. =D Love the caramel glaze!